I purchased the Jocole Skinny Pants as part of the Pattern Revolution Womens Bundle Up Sale. I was pretty excited about this pattern because I am a bit of a fan of skinny pants. I love wearing them and as a mother, I find that skinny pants, a tunic top and ballet flats are a classic yet comfortable look. Add that to a yoga waist band... what more could I ask for? After asking a friend of mine who was involved in testing the pattern, I decided that in this case I really needed to do a muslin. I often do new patterns in cheap or reclaimed fabric the first time I make them. This time I chose a bright peach cotton drill I picked up at a market for $4 for 5m, which I would never expect to wear. Just the ticket! As you can see from the pictures I am glad I took the time to make a muslin. I wanted to make sure these fitted me just right, so I measured myself again. The measurement chart had a thigh measurement - Hang on! I have never done that before! - I had to go and check out WHERE on the thigh I was supposed to measure. The answer was pretty simple, on the widest part. I compared the waist, hip and thigh measurements, to the measurement chart of the pattern and found that I crossed over 3 different sizes. It is times like these I am glad to have nested patterns. When tracing the pattern, I used the measurements for the waist, hips and thighs and customised the fit by blending the sizes. The first thing I noticed with the muslin is that it was only "skinny" to my knees. I am not really surprised by this as I have endless problems buying boots - my ankles are too skinny. Too bad I don't have that problem in other areas! A couple of centremetres off the side of each leg from the knee down took care of that problem. The other obvious problem was a gape just above my bum. The sway back strikes again. A great cheat sheet for adjusting for fit is located here. I went for the simplest method of fixing this and essentially made a dart on the centre seam of the muslin and cut that amount off the pattern piece. The result was a pretty flattering fit. Now on to the 'real' pairs. The first pair I made with some teal cord - basically because it's COLD here and it was in my stash. The stretch was a bit more than I expected because I haven't worn cord since I was a kid and didn't have a feel for the fabric. That is not all bad because they are sooooo comfy. Please excuse the slightly dodgy selfies! 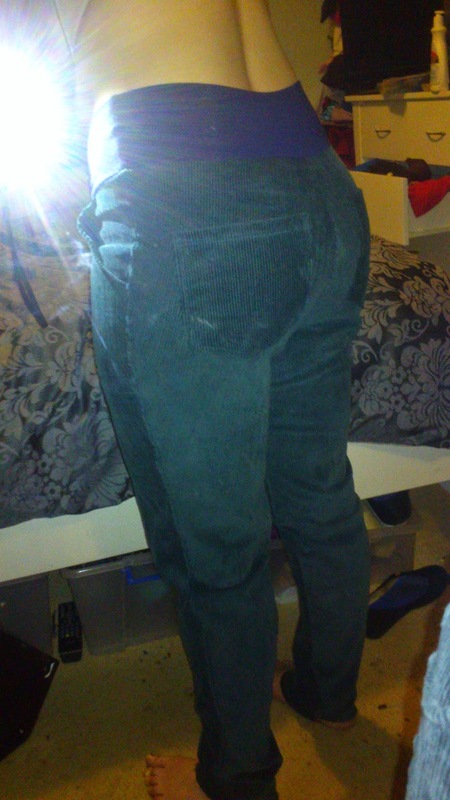 The other pair I made with denim look fabric and top stitched to look like jeans. 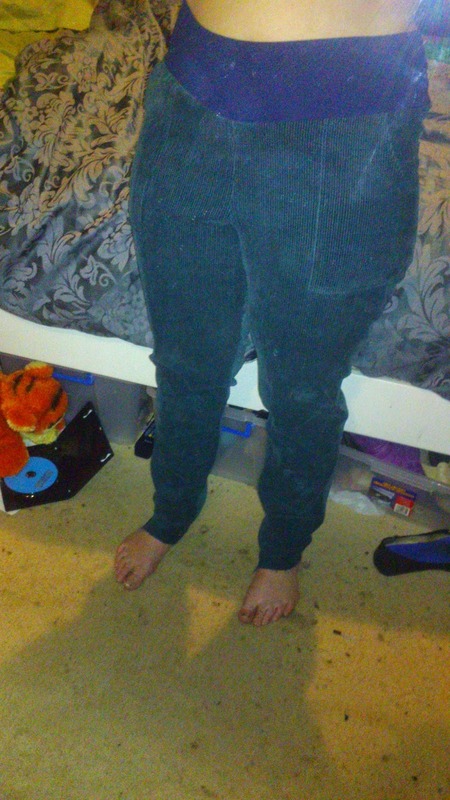 I have had lots complements on the finished pants so I am very pleased I invested in this pattern.